Outdoor cooking has never been easier than it is with these helpful tools. 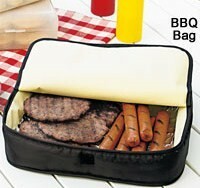 The BBQ Bag is insulated to keep food hot until you're ready to serve. Just load in chicken, hamburgers, hot dogs and more, then secure the fabric-magic closure. This decorative polyester bag is perfect for cookouts with dishes with different cooking times, or when you need to cook more burgers than can fit on the grill at one time. It measures 13" sq. x 3" and has an EVA bottom liner that resists heat up to 400°F.